Hi Guys ! Can't tell you how much I'm enjoying by taking part in various contests as a member of Indian Food Bloggers Meet. Few hours left for the gala event. Icing on the cake is the event is gonna happen at Bangalore so I will be staying with my sister. Ofcourse meeting my blogger friends is another high kick. This is my second savoury corn Baked dish for IFBM's as "An entry to the IFBM and Freedom Tree Baking Contest". Freedom Tree has given all the participants of IFBM to take up the challenge of baking a savoury dish with Fresh Corns. Last week I had posted Savoury Corn Tartlets, my 1st entry for the same. 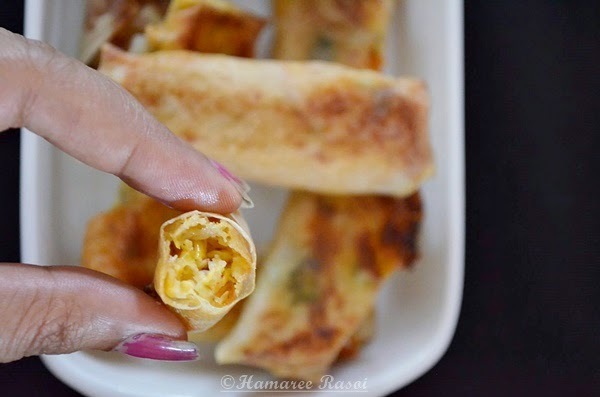 First of all thaw the spring roll wrappers by either keeping it in the refrigerator section previous night or leave it on the counter for about 30-40 minutes. Once the wrappers are defrosted, open it and cover them immediately with a damp piece of cloth. Otherwise they will dry up quickly and cracks will appear. Now take one wrapper at a time and place 1 tbsp of filling near one corner of the wrapper as shown in the picture below. Fold over the corner by holding it tight. Fold over right side by leaving no space and then fold over the left side. Now you will see a small triangle shape, brush a little water over there and wrap it neatly with no air pockets. Keep them all covered with a damp cloth as they dry out easily. 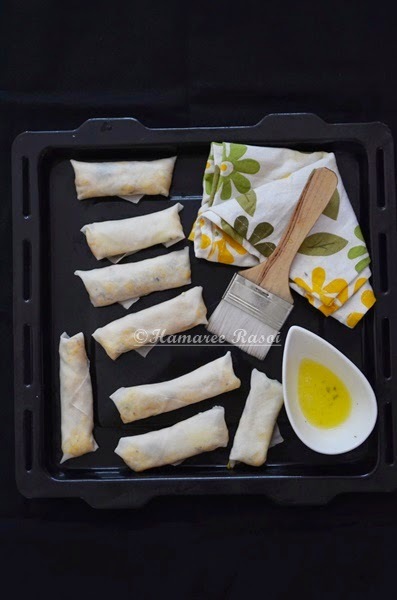 Place the rolls in rows on the prepared baking tray and lightly brush rolls with melted butter and bake them for initially 8 minutes. Turn them to brown evenly and let cool on rack. Repeat with remaining. Serve ! 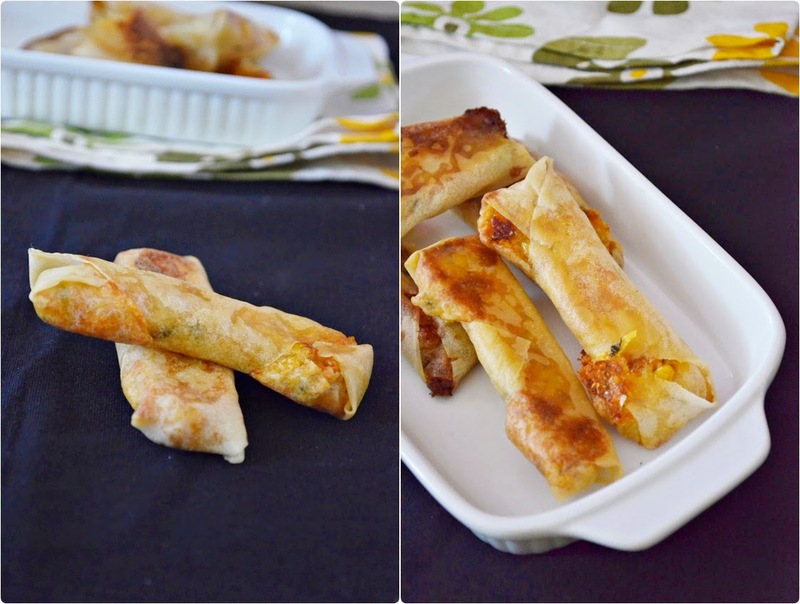 This is a simple and effective recipe for spring rolls. And cant' wait to meet you. Get ready to rock, girl! Nice recipe.. looks very delicious.. Such delicious looking snack! Yum! Looks so delicious Deepa....Superb !